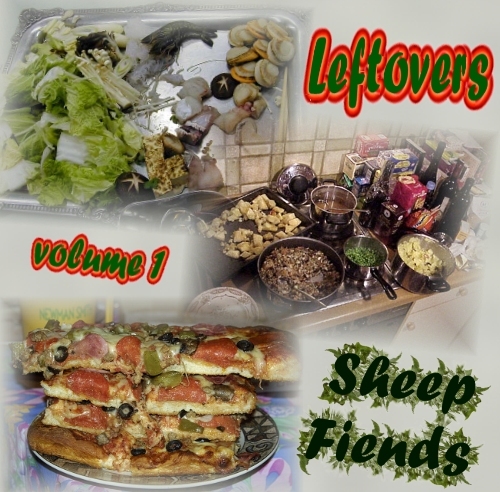 Leftovers is a CD series of fun tracks that almost got looked over. Enjoy! 1: Hey OK (7:27) Rating: 2 Record date: 12/09/2001 AAD by David Ladd Copyright © 2001 The Sheep Fiends Foundation. Contributions by Greg Winston are Copyright © 2001 Greg Winston. Other contributions are Copyright © 2001 The Sheep Fiends. This song as recorded with The Sheep Fiends © The Sheep Fiends Foundation. 3: Talkin' About Fried Chicken (6:12) Rating: 2 Lyrics by: MX Skroch Record date: 07/08/2001 AAD by David Ladd Copyright © 2001 The Sheep Fiends Foundation. 4: What's Become Of Us (3:00) Rating: 4 Lyrics by: Matthew Cramer & Scott Johnson Record date: 11/18/2001 Also appears on: Take Me Down Raw AAD by David Ladd Copyright © 2001 The Sheep Fiends Foundation. Contributions by Greg Winston are Copyright © 2002 Greg Winston. Other contributions are Copyright © 2002 The Sheep Fiends. This song as recorded with The Sheep Fiends © The Sheep Fiends Foundation. 6: Re Percussion (2:44) Rating: 2 Record date: 11/18/2001 Also appears on: Take Me Down Raw AAD by David Ladd Copyright © 2001 The Sheep Fiends Foundation. Note: "Jeff" joined on guitar. 8: Grindin' Blues (4:10) Rating: 3 Record date: 05/13/2001 AAD by David Ladd Copyright © 2001 The Sheep Fiends Foundation. 9: Scamper (6:10) Rating: 2 Record date: 12/09/2001 AAD by David Ladd Copyright © 2001 The Sheep Fiends Foundation. 10: Artists (3:16) Rating: 2 Lyrics by: Matthew Cramer Record date: 12/09/2001 AAD by David Ladd Copyright © 2001 The Sheep Fiends Foundation. 11: Thirty-One (6:10) Rating: 2 Record date: 07/08/2001 AAD by David Ladd Copyright © 2001 The Sheep Fiends Foundation. 12: Moody Roller (5:12) Rating: 2 Record date: 05/13/2001 AAD by David Ladd Copyright © 2001 The Sheep Fiends Foundation. 13: Little Pill (4:25) Rating: 5 Lyrics by: Matthew Cramer Record date: 04/22/2001 AAD by David Ladd Copyright © 2001 The Sheep Fiends Foundation.